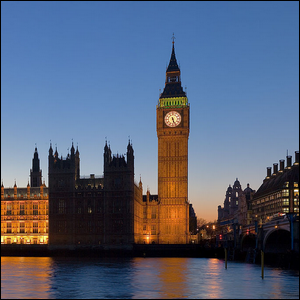 Big Ben, The Famous Clock Of London’s Palace of Westminster, Is Calibrated Using? The First Metal To Be Used By Humankind Was? The clock of the Palace of Westminster, or, as the historic London landmark is more commonly known “Big Ben” (a reference to the Great Bell inside the clock tower), is famed for its accuracy. Carefully managed and kept in immaculate condition, the clock has kept time accurately since it was completed in 1859. What’s the secret to the clock’s accuracy (attentive clock keepers aside)? Coins. Early in the clock’s life, its keepers realized the enormous pendulum inside the clock would need fine tuning to account for seasonal changes and to more finely calibrate the movement of the pendulum. Rather than come up with an elaborate plan, they simply stacked a small handful of coins on the pendulum to add the tiniest bit of weight. A single penny placed on the pendulum is enough to cause the clock to gain two-fifths of a second in a day. Note: Three of the ten original pre-decimal pennies were replaced with a 5 pound crown in 2009 and a few coins had to be removed in August 2015 as a time correcting measure.